On Thursday, June 20, 2013, the United States Mint began selling rolls and bags of 2013 Kennedy half-dollars. Price points vary with bags containing 200 coins at $139.95 and 20-coin rolls sold in units of two for $32.95. Half of the coins in each product option are produced at the U.S. Mint facility in Philadelphia while the other half are struck at the Denver Mint. 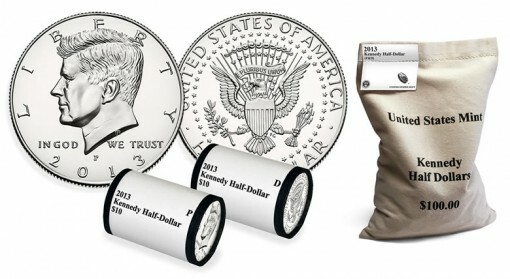 "Each coin roll in the two-roll set is wrapped in a United States Mint paper coin wrap that displays a ‘P’ or ‘D’ for its mint of origin and ‘$10’ for its face value," the U.S. Mint described in a news release. "Each bag is marked with a ‘P’ and ‘D’ for the mints of origin and ‘$100’ for the face value of its contents." All of the half-dollars are in circulating quality, the same as if produced for commerce. But since 2002, none have been delivered to the Federal Reserve for banks to order so you won’t see them in pocket change. The U.S. Mint produces enough to meet collector demand, making them available through numismatic products only. Coin production figures show plummeting half-dollar mintages after their circulation distribution ended in 2001. Annual mintage totals have steadied in recent years, hovering around the 3.5 million mark. *Though unlikely, demand could push mintages higher for 2013. In addition to this year’s coin, the U.S. Mint continues to offer 2012 Kennedy half-dollars. Bags of them sold out earlier this year but rolls remain available. The following table offers sales of 2011- and 2012-dated 50-cent pieces through to Sunday, June 16, 2013. *NLA = No Longer Available. Rolls and bags of Kennedy half-dollars are available through the U.S. Mint website on this product page. Orders may also be placed by calling the Mint’s toll-free number at 1-800-USA-MINT (872-6468). There are no household ordering limits. the 2013 Mint Uncirculated Coin Set that went on sale June 4 for $27.95. Coins in the Proof Set and Silver Proof Set are struck at the U.S. Mint facility in San Francisco and have a "S" mint mark. The uncirculated coins in the 2013 Mint Uncirculated Coin Set are produced in Philadelphia and Denver and carry the same mint marks as the coins found in rolls and bags. Circulating-quality Kennedy halves when introduced in 1964 were produced in 90% silver while those from 1965 to 1970 were struck in 40% silver. Many of these silver half-dollars have little to no numismatic worth and are now sold and purchased simply for their melt value. Even with silver plunging to below $20 an ounce, a single Kennedy half-dollar from 1964 has a calculated melt value of over $7. One from 1965-1970 has a melt value of nearly $3. Today, 90% silver halves are available in the aforementioned Silver Proof Sets. For the 2011 half, can you help me get the math to add up. It looks like they sold roughly 2,000,000 halves in 10K of the 200 coin bags, another 1,000,000 in 25K of the 40 coin roll sets, and another 1,000,000 in the 500K mint sets that were sold that year. That adds up to 4M but they also say they old made about 3.5M that year. I’m still trying to figure out why (and I don’t know if they do this anymore) you could buy dollar coins at face value from the mint but you can’t buy half-dollars from the mint at face value. One would think it would help the coins, at least in principle, circulate since banks and Federal offices like the USPS are not compelled to order/use them. P. S. – I looked at an uncirculated halve from a bag and one in a mint set and I can see the difference in the finish. Same with the AE silver dollar; compared a bullion uncirculated dollar with the Mint uncirculated dollar. Difference is very clear to me; but only if you put them side by side. Again, my opinion only – buyer beware – know exactly what you are getting. @Tim : I heard about the airlines miles scam people were doing with them. I guess I’m just offended these coins are made for way less than face value and yet are sold to collectors only at inflated costs instead of to “circulators” at face value to spend around towns. One would think there would be enough of “us” to get the denomination circulating, albeit lightly, again. I do what I can at work but the shift I do means I can only give out about $20 a week in halves in change (my bank will get them for me). P.S. @Tim : I would prefer to give out newer ones if only to show that the coin still exists. Handing out ones from the 1970s and 1980s suggests the coin has long since ceased to be made. It would be nice to be able to bring in rolls of the current year but the mint will not oblige unfortunately. How can I buy 2010, 2011, 2012, 2013 Kennedy half dollar coins from Denver and Philadelphia mints?